You'll notice I've been featuring a lot of ethnic stores lately. Expect that to continue! I've noticed the smaller, ethnic, and urban stores are significantly underrepresented in online supermarket blogging and coverage. This particular store, in Hyattsville, MD, a Washington, DC suburb, has gotten attention because it is a former Giant-MD store with the majority of its decor intact. It's also a pretty great ethnic supermarket. One interesting thing to take into account before touring the store is the demographics of Washington, DC as compared to those of its suburbs. Generally speaking, in the New York City area, the urban areas are the more ethnically diverse and lower-income, while the suburbs are higher-income and less diverse. The exact opposite is true in Washington, DC, meaning that the city stores are primarily extremely boring Safeways, Giants, and Whole Foods. The immediate suburbs, however, have much more interesting and diverse supermarket options. As a Giant, this store had gates around the entire front walkway area to keep the carts in that part and prevent them from being taken into the parking lot. Atlantic has cut out the gates in certain parts to allow carts to be taken into the lot. As is expected, the selection of carts is rather random here, although the majority are actually real Atlantic Supermarket carts. You enter to the far right in the picture above. Immediately you make a right turn to enter the large produce department. The produce runs along the front wall and part of the right-side wall, with additional cases and displays in the middle. This store seems to focus heavily on quantity . . .
. . . and size . . . The above photo shows the entrance (far left) looking along the front end (just past the big displays). In the middle (near the post) I believe there is a counter selling maybe electronics. There is more general merchandise along the front-end and in the far corner. 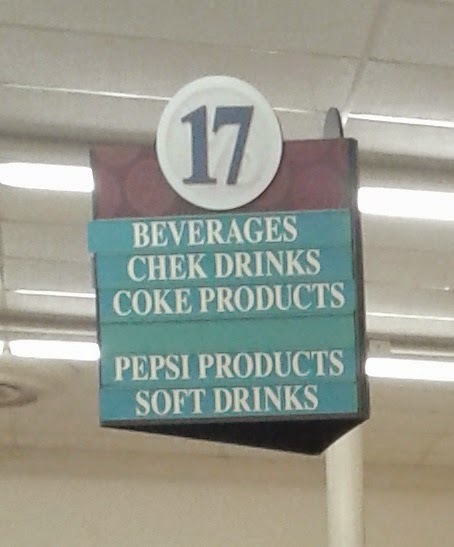 The first aisle is dairy with items on sale on the left and in the center. We are looking towards the back of the store in the above photo. The remaining fresh departments are along the back wall. If I remember correctly, they go: seafood, hot food, packaged meat, meat service, and then an area where Giant would have had a deli (Atlantic does not have a deli). There was a very nice hot food department, featuring both Latin American and Asian foods, reflecting the area's population. Giant's deli would have been to the left above. The sign remains, but the area was filled with random merchandise on sale. The last aisle has frozen foods on one side. We're looking towards the front of the store here. Up in the front corner there is a strange area that Atlantic has closed off and is just using for storage of boxes and other junk. It looks horrible. I'm not entirely sure what Giant would have had here (maybe just more grocery aisles). You can also tell the age of the decor by looking at these pictures on the walls; a simple paint job and new pictures would really liven up the appearance of the store. 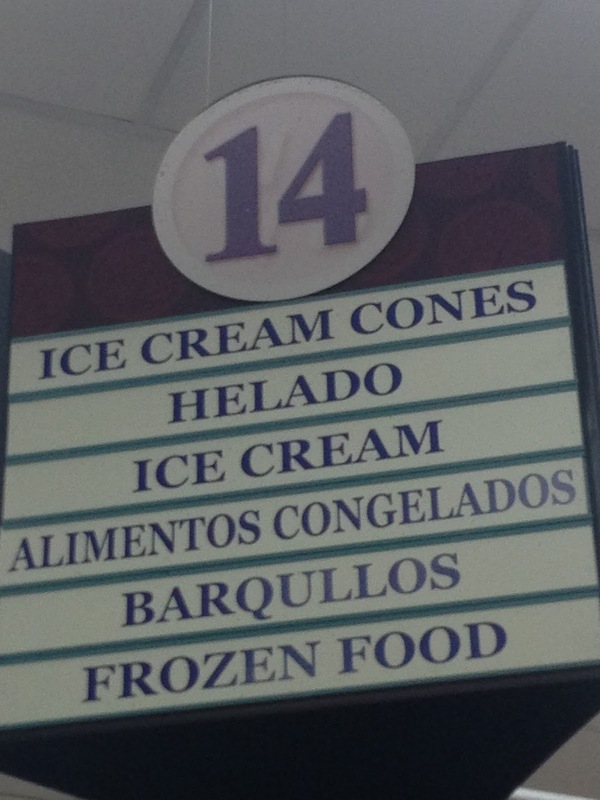 Like many other ethnic supermarkets, there is a very substantial non-food selection, but virtually no HABA. I don't know why this is the case just about everywhere! It's really hard to see in this picture, but this is actually an old Winn-Dixie aisle marker. You can see a better picture of one at Albertsons Florida Blog by clicking here. All of the aisle markers are actually old W-D signs, who knows where they're from! This is as much HABA as they sell. The entire front-end is also not used; the area behind the last few registers is closed off. Although this store is interesting for its history, it's also a pretty good ethnic supermarket. I just wish it were a little bit cleaner and less cluttered. Although that store has 100% decor from another chain that never occupied that location! And you're welcome for the links! I remember seeing those photos of that former Acme in Fallston! That was pretty weird seeing Safeway decor in there. "I've noticed the smaller, ethnic, and urban stores are significantly underrepresented in online supermarket blogging and coverage." - Around my area, at least, that's because those stores often have no photography policies (at least as far as the ethnic goes - not much urban around here), which are very well-enforced, not to mention it'd be difficult to get interior photos anyway due to the crowds! These sorts of stores seem to be considerably more popular in real life than they are represented online. I'm glad you're making an effort to better even out the disparity! As for me, there are a couple of cool old stores in Memphis that have retained some super old décor under their new owners (including Schnucks décor, albeit repainted, and Seessel's by Albertsons décor). But not only are those out of the way and proponents of the no photography policy, they're also not in the best of areas (at least one of them, anyway)... so I feel best avoiding them altogether! Ironically, in my experience, the urban/ethnic stores around me really don't care about photography. (In one store, I took a picture of the café area, which had a few people sitting in it eating, one of whom looked at me kind of suspiciously, but didn't say anything. I later found out he was actually the owner!) And it can sometimes be easy to blend in if there are a lot of crowds. Around here, it seems the big chains are more concerned about photography than the independent stores. That's an interesting thought, that decor warehouse! A search for "supermarket decor for sale" didn't yield much, though! Ha! It's the complete opposite around here XD Of course, as far as big chains go, it's just Walmart and Kroger primarily! There are a few other higher-end and lower-end grocery chains, but none that I've been to or taken photos of. And then there are other places like Target that I also have photographed with (knock on wood!) no issues. Malls (especially the indoor/semi-indoor ones) tend to be the biggest sticklers (besides those ethnic grocery stores I mentioned) locally. For that reason I do my best to avoid taking mall photos. It was worth a shot, though, haha! A few notes on this store... This is a late 1950s Giant Food store. It is one of their earliest stores in the Maryland suburbs. Giant was here until the mid-1990s. It was in the early 1990s that Langley Park's (postal address is Hyattsville) demographics began to change to be predominately Latino. I was not surprised when Giant closed their store here as they really had done nothing over the years to expand or remodel the store to be in line with their larger stores they were building in the 1980s and 1990s. Plus Giant has a large modern store about a mile and a half away at Flower Avenue and Piney Branch Road. Incidentally the original Flower Avenue Giant was the first Montgomery County Giant store to open in 1950. The front section of Atlantic Supermarket that houses the front end and produce is an expansion that was put on the building by Atlantic. The original Giant area is what is now the grocery aisles and the service areas in the back. The decor that is still on the walls is actually the standard early 1980s pre-neon Giant decor. The red tile around the decor pieces was a part of this package but was only put in stores with no other decorative wall pieces to set off the departmental signage. A lot of the 1960s and 1970s stores were built with colonial or ornmental frames around the areas where department signage was installed. Until the early 1980s decor was put in the rear wall would have had a large lettered store directory. The cases in the back and frozen foods with the exception of the ones at the fish department and hot foods are from Giant. The back dairy cases are from Giant while the ones in the front within produce were installed by Atlantic. It is interesting that the deli is down by frozen foods. These stores typically had dairy on the right side of aisle one with milk in the back right corner. Then down the back wall would have been the deli next to the milk case usually with a corridor in between to the back room. Then meat cases and possibly a small bakery down by frozen foods. If there was a seafood counter it would have been very small and on the right end of the meat cases. The area up front you note as closed off by Atlantic would have been grocery items as you noted. Over the years it would have rotated between commercial breads, beverages and home/seasonal items depending on what layout was being used at the time. Atlantic had to have increased the length of the grocery aisles as Giant's small front end would have needed to be contained in the original part of the building. Lastly, the flooring in the store was replaced after Giant closed. When I visited the store there were places where the floor tile had come up and the original pink terrazzo flooring was showing through. Giant did not start using floor tile until the remodels just before the Ahold buyout. All in all an interesting store. It isn't as well preserved as some other ethnic grocers who have taken over traditional grocery stores but nonetheless interesting for grocery store history fans. Thanks for all the history! I'm guessing that the flags and the mural-type pictures in the produce department are new (by Atlantic), is that right? Also, the floor is in pretty bad condition for being relatively new, which is what made me initially think it was left from Giant. Sorry it took song long to reply. The flags and mural decor in the produce section were installed by Atlantic. Regarding the floor, Giant would have had a terrazzo floor when they opened this store. In that era it was usually a gray color or pink. The pink terrazzo was a particularly pretty color that I know a lot of people really liked. It is possible but not likely that Giant replaced the flooring before they left here. When Giant closed the store the floor was around 40 years old. The reason I thought the tile floor came after Giant was that I saw many instances where pre-Ahold Giant repaired and refinished the terrazzo floors in their older stores. I should amend what I said in my original post about the floors to say that the mid-1990s new build red neon stores did have tile floors in many cases. However the tile over terrazzo only started when the Fresh Ideas, Great Values remodels were rolled out just prior to the Ahold buyout. And in those cases the tile color was usually a light tan, almost beige to coordinate with the wall color. There are only two vintage Giant-MD stores left that I know of - Milford Mill west of Baltimore has the 1980s/1990s neon interior package and Fort Washington has the more complete version of the 1980s pre-neon look that is leftover in Atlantic Supermarket shown here. 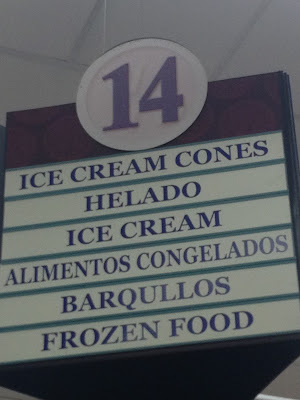 I remember when Toys R Us was in the Langley Park Plaza, Atlantic Supermarket's front entrance sign was just a simple straight red rectangle with a thin white rectangle around and Atlantic Supermarket written in white print. A few years ago, I noticed Atlantic Supermarket changed its front entrance store sign to a more modernized, white castle like background with blue lines and the Atlantic Supermarket name written in red print instead of the original white print. I am wondering when this change took place. Was it just an expansion, or modernization plan? Was the sign changed when Toys R Us left and Regency Furniture took over at the beginning of 2007? Atlantic's previous store sign seemed much more historic and seemed to be a lot smaller and simple. Also, my guess is that when you say this Giant Food Store closed in the mid 1990s, you mean the middle of 1998. That is when Atlantic Supermarket was reported to have opened and when the Royal Ahold Buyout of the Giant Food Supermarket chain happened. Interestingly prior to Toys R Us, K-mart used to be in the plaza by Giant. I really don't know much about the history of this store. I'd try getting in touch with Michael Hale, who gave the history above: https://www.flickr.com/people/mjhale/ He might be able to answer your question. Sorry.